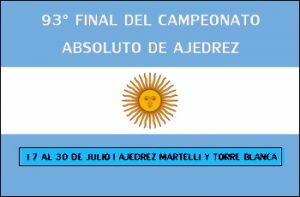 The 93rd Argentine Championship is being held in Villa Martelli between the 17th and the 30th of this month. While several of the top Argentine players are absent, notably Mareco and Diego, the 14-player round robin is still quite strong as up and coming talents are given their chance to clash with the likes of Peralta, Pichot and Perez. The 38 year old Fernando Peralta has been residing in Barcelona, Spain for as long as I can remember (along with numerous other Argentine players) but remains loyal to Argentina and has no intention of changing federations. Fernando returns to Argentina annually and remains active in his native country. 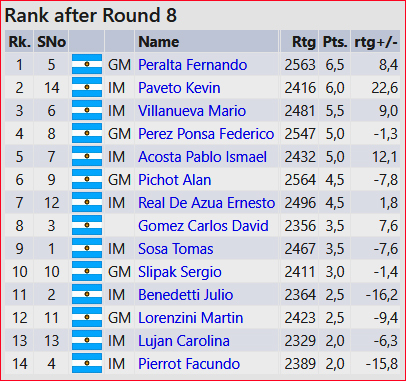 This year the level of Peralta’s chess is a bit higher than normal and I have enjoyed very much playing over his games from this championship. After 8 rounds he has 3 draws and 5 wins. I present his games below. 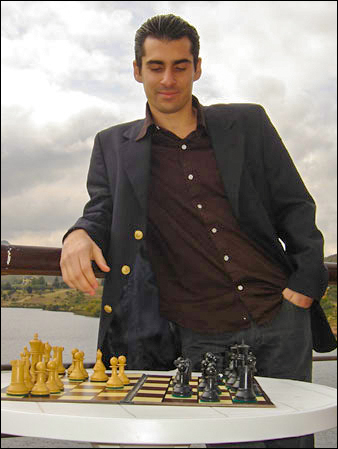 Peralta’s style of play is what I would describe as pragmatic: sound strategic planning and deep middlegame manoeuvres. His opening preparation and endgame technique is of the highest professional level. Little wonder that Fernando has been a main stay of the Argentine National Team for years. First round nervousness! Peralta was pressing the entire game and soon seemed to be on his way to a clean win. His endgame advantage was clear. Some uncharacteristically hurried play allowed his opponent to escape. After missing his chances in the previous round, Peralta plays safe, takes no chances and regains his confidence with a ‘normal’ game. Peralta’s choice of Caro Kan instead of the Modern or the French shows that he wants to take no chances! A powerful display by Fernando as he skillfully outplays his less experienced rival. Peralta likes small strategic advantages (Bishop pair; strong centre) and really knows how to exploit them. Another solid Caro Kan, this time against the sole female participant. At one point it seemed that Peralta was getting some chances when he doubled on the d-file, but White kept things undercontrol. A beautiful strategic game that would have even made the late Tigran Petrosian proud had he played it! Once again, small strategic advantages, subtle maneouvring and great endgame technique! Having regained his confidence, Peralta ‘risks’ playing the French. An exciting opening leads to a sharp middlegame, and then an ending with a tiny advantage for Black. White threw away the point right before the time control, probably short of time. Very interesting game! What a game! Black emerges from the opening with a good game, but goes wrong when he ‘lures’ the White Queen to capture the a-pawn. Peralta had seen further and gave up his Queen for Rook, Bishop and pawn. Peralta missed a quicker win by keeping both rooks on the board, but even so, won a classic ending. Peralta plays the riskier Modern Defence, showing that he is gaining confidence round by round. Here White loses his a-pawn and Peralta never looked back. Previous story Why D’ya Do It?